Disclaimer: some of the links in this post are affiliate links. This means that, at no additional cost to you, I will receive a commission if you click on the link and make a purchase on that website. 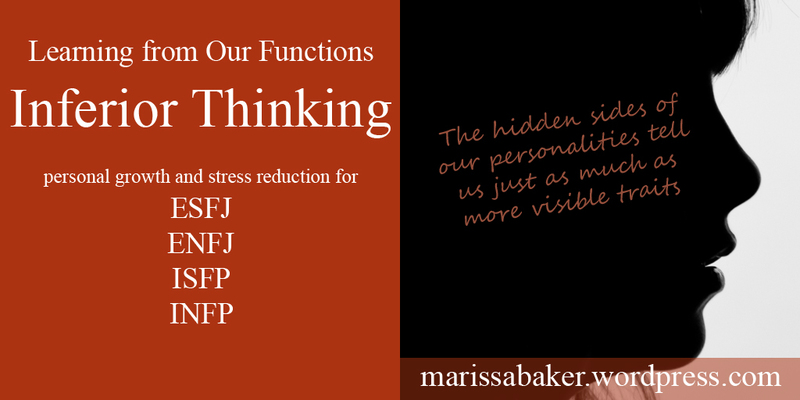 When we’re talking about someone’s personality type in the Myers-Briggs system, we usually talk about their primary and secondary functions (also called mental processes). An ISFP, for example, leads with a process called Introverted Feeling (a judging/decision making function), which is supported with Extroverted Sensing (a perceiving/learning function). An ENFJ, on the other hand, leads with Extroverted Feeling, supported by Introverted Intuition. Using Personality Hacker’s car model,* we can compare our primary function to an adult driving a car, and the secondary function to a second adult navigating in the passenger seat. Each type also has a tertiary function (the opposite of their secondary function), and an inferior function (the opposite of their primary function). These are less well developed. In the car model, our tertiary function is like a 10-year-old sitting behind the co-pilot, and the inferior function is like a 3-year-old sitting behind the driver. The processes you use most readily are the ones typically visible, and they define your personality as others usually see it. Our less developed functions play a significant role as well, though. Today, we’ll be looking at types which use Thinking as an inferior function. Inferior functions often show up in the type of hobbies people choose. INFPs and ISFPs, for example, may enjoy strategy games or something like crossword puzzles to engage their Thinking side. More than other types, though, dominant Feeling types often choose careers that tap-into less dominant functions (Was That Really Me? * Quenk 149). An ENFJ might use their thinking and intuitive sides to work with computers, or an ISFP could work in engine repair using their sensing and thinking sides. In this case, they’d be using their dominant function in hobbies and play, and their less-developed functions at work. ENFJs, ESFJs, ISFPs, and INFPs in this type of situation often retreat into nature or opt for a more social activity to relax. 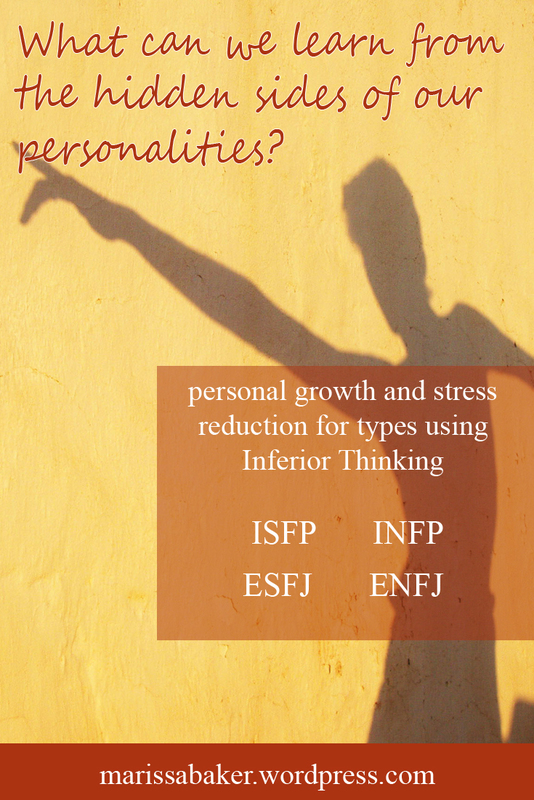 ISFPs and INFPs also lead with a feeling function, in this case Introverted Feeling. This makes Extroverted Thinking their stress function, and it looks different than the Thinking used by ENTJ and ESTJ types. Here are the traits Quenk associates with inferior Extroverted Thinking (and their counterparts in Te-dominant types). Inferior Thinking types are sensitive about how other people perceive their intellect. They’re very careful when handling facts and can become irritated or defensive if people question their competence (or if they feel someone might question them). When stressed, they’re quick to point out other peoples’ errors and judge them as incompetent, often aloud. Normally, dominant Feeling types value peace and harmony, but when stressed they are much quicker to voice their criticisms. They can also turn this “excessive” or “aggressive” criticism inward. I have several good friends who are ExFJ types, and they are very hard on themselves whenever something goes wrong or pulls them into depression. It’s very frustrating to outside observers because it’s almost impossible to talk them out of self-criticism. When working out of their stressed function, Feeling types, especially ESFJs and ENFJs, often insist on solving problems alone and fall into a pattern of “convoluted logic” (Quenk 154). One ENFJ that Naomi Quenk interviewed talked about coming up with a plan to break her leg in an accident so she wouldn’t have to participate in a sporting event that had her stressed out (she didn’t actually go through with it). Stressed Feeling types often feel compelled to take some kind of action to correct a problem and regain control. The introverts, whose stress function is extroverted, usually try for outward action without thinking it through (Quenk 108). Extroverts, with their inferior introverted function, are more likely to take internal action and seek out books or lectures they think might help (Quenk 155). All Feeling types benefit from alone time away from everyday routine to process stressful situations. Introverted types especially say that their “grip experience” needs “to expire on its own” (Quenk 115). They need time to process what’s going on without other people trying to interfere too soon. Some INFPs and ISFPs, especially women, want to talk eventually but not right away. ESFJs and ENFJs do need alone time, but they also need someone to bounce ideas off of much more than the introverted types. They need a friend who is willing to listen without criticism, take them seriously, remind them of their good qualities, and reassure them that they’re a good person (Quenk 163). Many Extroverted Feelers also appreciate someone taking the time to involve them in a low-pressure social activity. For many people, the side of their personality that’s related to the inferior function stays a mystery throughout their lives. Type theorists say that most people who successfully incorporate their inferior function do so around middle age, but you can start working on it sooner. Isabel Meyer suggested that every type can, and should, exercise all their functions on a regular basis when making decisions. Dominant Feeling excels in weighing how much you care about different options, takes into account others’ well-being, and seeks the most authentic and harmonious solution. Making a conscious effort to incorporate Thinking adds a level of impersonal analysis that helps when working with facts and making long-term plans (Meyers, Gifts Differing *, 197). Naomi Quenk says that ENFJs and ESFJs who successfully incorporate their inferior functions learn to take better care of themselves rather than always putting others first. They’ll often dig into their inner lives more fully and give themselves permission to explore interests they’d pushed aside when younger — like one ENFJ who left a successful law practice to become a minister (Quenk 165). The introverted types also become more comfortable with themselves, and more confident when making decisions. Incorporating their inferior Thinking helps INFPs and ISFPs cope with their own shortcomings and relax (Quenk 117, 118). It also helps both types learn to deal with outside criticism effectively.